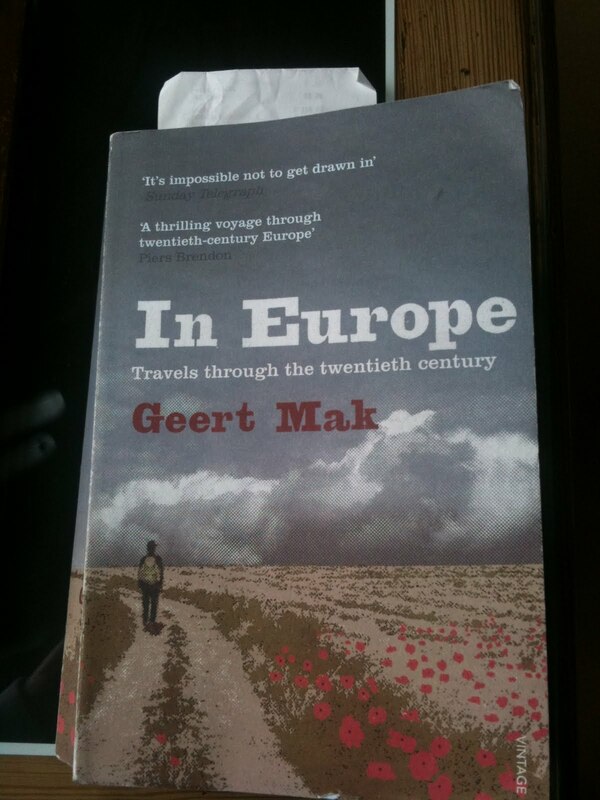 I've just finished In Europe: Travels Through the Twentieth Century by Geert Mak. I was so impressed with it I've bought a few copies to give away as Christmas presents. This is the copy I've been carrying around with me for the last couple of weeks, with the receipt I've been using as a book mark. It's an 800-plus page book so I felt the usual sense of achievement that I was not merely getting through it but also enjoying it. I liked feeling it in my hand and putting it on the bedside table at night. I've also bought myself a Kindle, which clearly has a place for anyone who does a lot of reading. But if I'd read "In Europe" entirely on the Kindle I would miss not being able to look at it. If you've invested this much time in something you like to be able to see it and touch it. I'm the same with music. Downloads are fine if all you want to do is listen. But if you really appreciate something you want to own it. After the usual annual conversation between self and GLW (her: "I don't have a clue what to get you for Christmas", me: "Well, we've been together for nearly 20 years; don't you know me by now?") I have caved and put a Kindle on my list for Santa, and I must admit I'm looking forward to it in the way that one always looks forward to getting new toys. I don't know how I feel about it, though. Even more than with music I love the process of book-buying and, as you say, the idea of ownership of a tangible *thing*. I've become accustomed to downloading music, I suppose, although even now if it's an album I *really* want I get the CD. Perhaps it'll be the same with books. As a (very happy) Kindle owner of six weeks, I tend to agree. My house is groaning with CDs and books of which ~10% are ones I want to keep. The remainder are things that were an ephmeral fancy or a plain old punt. I'm very close to making the jump to downloaded music. The punts and ephemera can be handled by the Kindle and the iPod; the keepers can be handled by me. Except that surely that means you'll end up buying the keepers twice -- once as a punt, on the Kindle, then again as a book? Quite happy buying books as downloads - I read them on my phone. Instant gratification. The other way a lunch guest was 1 hour late and in that time I read an interview with an author in the Guardian, downloaded a free sample chapter, liked it and then bought it and read 3 or 4 more chapters before some delicious pizza. Portability. My phone is always in my pocket. I can and do read a few paragraphs waiting for a bus, sitting in the loo, in bed, standing in the kitchen whilst the kettle boils. I'd never do this a book as it takes special effort to remember to carry it everywhere. One of the reasons I enjoyed Leviathan, or The Whale so much was because it was such a well put together book. Lovely paper, fonts and images and a cover that was beautiful to look at. Highly recommened. After reading this, I did a quick mental calculation and realised that I'm paying for the storage of boxes of books that would easily cover a iPad and Kindle in a year. Not counting the gym membership I don't use. That's another iPad right there. Like many compulsive readers, I always fear/know that I will never have enough time to consume all the books that I could conceivably want to read. Now that ebooks are becoming so popular, I have a new nightmare scenario: I start reading a web-enabled ebook of a work like Ulysses, where the publishers provide lots of annotations but also allow other readers to add comments, opinions, and so on. One could easily spend one's entire reading life trapped within this one, ever-expanding ebook. I'm just on the last few pages of 'In Europe'. It's not often that you find a book of 800 plus pages that is genuinely engrossing from start to finish. For the last few weeks I've been carrying it around with me from room to room, I can't seem to leave it on the bedside table. I'll miss that hefty weight in my hand when I finish it. "But if you really appreciate something you want to own it." That may be true for you, but it's not for me, and I suspect it's even less true for people just entering adulthood now (though that's only an anecdotal observation, I can't back it up). There's a superior tone to your comment that may or may not be intended, but I don't think there's anything inherantly better or more worthy about owning an object, much like writing a band's name on your school bag doesn't neccessarily mean you like that band more than the next person! For me the concept of ownership is vital (especially for music). Spotify is wonderful, and the ease of sharing possibly its biggest plus. However the choice is overwhelming. If I've invested cash (however small) in music, I make more of an effort when listening, and the experience consequently enhanced. As a gadget crazy person, I really like the idea of a Kindle. That said I could at a push use the iBooks app on my iPhone. It's interesting that Rob mentions how it has changed the way he reads books now. It looks like it will go hand in hand with Internet Browsing and E-Mailing on the move. As for the issue with owning and storing numerous books, we don't have that problem in our house. My wife moves alot of her books on once she's read them to other members of the family, charity shops and swap shop type outlets. That you aren't able to do with a Kindle. As for the owning of music, I purchase albums by downloading them, but only if they are cheaper than buying the CD. Again, we tend to use the second hand market for this as alot of my recent purchases have been of older music. Plus also, it doesn't really matter to me whether it's a new CD or not. The main thing is whethe it plas OK for me to rip it for use on the iPod.